Authors teaming up in the mystery world are few and far between. Sure, the Ellery Queen cousins (Fred Dannay and Manny Lee) teamed up in writing mysteries featuring sleuth Ellery, their joint creation. Likewise for Emma Lathen (Mary Latsis and Martha Henissart) and the sleuth they created, John Putnam Thatcher. Married couple Frances and Richard Lockridge teamed up to give us their married-couple sleuthing team of Mr. and Mrs. North. Perhaps the collaborative duo with the most sleuths jointly created were Richard Levinson and William Link, who teamed up to create Columbo (now of Peter Falk fame) when they penned the stage play Prescription: Murder. They would go on to create other sleuths too, including Jessica Fletcher of Murder, She Wrote. Far more rare, though, is when two writers with individual success and individual sleuths collaborate, allowing their sleuths to work together. The best example that comes to mind is Bill Pronzini and his Nameless Detective teaming up with Marcia Muller and her sleuth Sharon McCone. In their case, the teaming-up was logistically made easier by the authors being husband and wife. Now imagine two successful mystery writers teaming up, each bringing their own sleuth to the table, in the days before the Internet, in the days when long-distance telephone calls were too expensive to allow for lengthy chats—and when one of them often had no phone at all. That was the situation when Stuart Palmer (and his sleuth Hildegarde Withers) teamed up with Craig Rice (and her sleuth John J. Malone). “Once Upon a Train” was the first story in which the ever-battling Miss Withers and the ever-bibulous Mr. Malone appeared as a ’tec team, and also the first story, to the best of our recollection, in which two well-known mystery writers combined their chief characters—in this case, a dipsodetective and a spinstersleuth. . . . the great John J. Malone, a rowdy, raffish legal beagle with an irrepressible fondness for wine, women, and song, wiggles and wriggles himself into a seemingly impossible predicament, whereupon the prim and prudish super-duper snooper Hildegarde Withers extricates the perennially hungover John J.—with the extricating process always rife with risk and full o’ fun. In the 1963 collection, the “Crime-Busters” tale would appear as “People vs. Withers & Malone,” the title it had when originally submitted to EQMM by Stu Palmer. The first two pair-ups were “by Craig Rice and Stuart Palmer.” But for the final four, the order of the authors in the byline was changed to “by Stuart Palmer and Craig Rice.” Read on and you’ll figure out why. Whose idea was it to pair Withers and Malone? We don’t know. In the preface to People Vs. Withers & Malone, Stuart Palmer wrote that Rice believed it was Palmer’s idea, that editor Queen believed it was Rice’s idea, and that Palmer himself believed it was Queen’s idea. Throughout the writing of the six stories, Stuart Palmer lived in Southern California. Craig Rice lived in Southern California some of the time, in New York some of the time, and had brief stints in Mexico and New Mexico. Her face seemed faintly familiar, and Malone wondered if they’d met before. Then he decided that she reminded him of a three-year-old who had winked at him in the paddock at Washington Park one Saturday and then run out of the money. The tale was one of seven Second Prize winners in EQMM’s Fifth Annual Detective Short Story contest. (“The Gentleman From Paris” by John Dickson Carr took top honors that year.) The deadline for submissions to that contest was October 20, 1949. From Craig a special delivery package yesterday morning at the crack of dawn, containing a lot of contributions to our joint effort. After running it through the typewriter and following most of her cuts and putting in her dialogue, I honestly feel that “You May Have the Body” represents a true collaboration, in spite of the difficulties. Hope you like it. Of course we’ll make any changes you suggest, as we both have the highest regard for your editorial ability and your perspective. All in all, this has been a lot of fun for us and Craig wants to try it again. She has been kind enough to let me be the one to make final decisions. As I said before, if you don’t like the thing, blame me and if you do [like it] we’ll both take bows. This story would be published as “Once Upon A Train.” So the authors met the contest deadline with about ten days to spare. I wonder if it’s significant that Palmer relays Rice’s eagerness to collaborate again but refrains from saying the same about himself. Dannay liked the story enough to buy it and re-title it, writing “$350” on Palmer’s letter, which obviously accompanied the manuscript. So this first pairing was a true collaboration. But a month later Rice would be hospitalized and her contributions would become much slighter. That was a gentlemanly and polite understatement. Bluntly, she [Rice] is now trying to break the dope habit which she picked up at Camarillo. Palmer’s assessment of Rice’s condition is corroborated in Who Was That Lady? Craig Rice: The Queen of Screwball Mystery by Jeffrey Marks (2001, Delphi). This is as close as we’ll probably ever get to a biography of Rice, who did not leave much of a paper trail behind her and whose statements were often far from the truth. The book, alas, does not mention any of Palmer’s letters to Dannay.
. . . spent three hours with Craig, and wrote you a long letter about it last night which I have torn up. I am much distressed, as the situation is very much worse than you or I or anyone imagined. We discussed “The Tie that Binds” and at Craig’s request I am going to complete it along the lines we worked out, as best I can. Then it’s up to you. She needs the money and more than that needs the buildup to her self-esteem of having a story bought and printed. What an odd and dismaying world it is, sometimes. Craig expects to fly to Chihuahua whenever and if ever we get our MGM dough. Bishop expects to go along and marry her after she gets a quickie divorce from the current husband, but Craig plans or says she plans to ease him out of the picture. As you know, I had not seen her in six years or more, and the change is devastating—though she has her hair a nice soft brown color instead of its original gray or the recent jet black. She is very thin, and that afternoon was so shaky she could not sign her name. Within a year Rice would marry Paul Bishop. By now Palmer knows enough to qualify Rice’s stated plans as just that—statements. He no longer assumes she will do what she says she will do. The money from MGM was for Mrs. O’Malley and Mr. Malone, a 1950 film with James Whitmore as Malone and Marjorie Main as O’Malley (a renamed Hildegarde Withers). The flick was loosely based on “Once Upon A Train.” MGM had bought rights to adapt the story however they saw fit. Wrote Craig and asked her if she felt up to reading it and adding dialogue or anything, but haven’t heard from her and imagine she is off to Chihuahua with or without Mr. Bishop, who has a police record as long as your arm—and my arm too. Maybe someday the old girl will get back in the groove again but it won’t be in the immediate future, I’m afraid. According to Marks: Paul Bishop met Rice in 1950 when both were patients at the same mental institution; they eloped to Chihuahua, Mexico, and married in 1950 or 1951; they parted ways, without divorcing, in 1951; Bishop was Rice’s fourth husband though Rice considered him her fifth. In any case, “Cherchez La Frame” was sold to EQMM. Craig has a beginning, all by herself, which she is going to type up when she gets her typewriter out of hock. I take it from there. CR is in a bad way. Her husband, who recently dislocated her hip and shoulder, is back with her and made her apply for dismissal of the legal incompetence order, just in time to delay the sale to Metro a few weeks. Otherwise he would not have, under California law, had his legal half of her share. Yes, husband Bishop injured Rice, not himself. “Metro” is the first “M” in MGM, which purchased an option on “Cherchez La Frame” but never filmed it. Don’t know if or when Rice recovered her typewriter, but nothing ever became of the story beginning that she claimed to have for Palmer. Was up in LA for the meeting of MWA [Mystery Writers of America] and thought I might see Craig there, but she didn’t show. And neither her lawyer nor agent knew where she was. I got home and found a card from her saying that she was living in a shack on the beach—no address—but could receive mail general delivery Santa Monica. Can you imagine trying to collaborate on a mystery story with someone who lacks a telephone and even a specific address? What of Craig? I promised to send her a copy of any story with Malone in it, but she seems to have dropped out of sight. Last I heard she was engaged to a millionaire from Lichtenstein and needed a quick fifty which I didn’t have. The “millionaire” is a reference to Henri Maliverni, who Marks tells us was an unemployed writer that Rice would introduce as a wealthy man from Lichtenstein (sometimes Luxembourg or Lithuania). Rice never did wed Maliverni but did pass him off as her husband. I hear nothing from Craig, and that little bad. I guess I’ll really have to do the Malone-Withers story alone, and with it forward the release from Craig or else a photostat. Without the need to work with Rice, Palmer wrote the story and submitted it two months later to EQMM, which purchased it for $400. For this and all the remaining Malone/Withers stories the byline was flipped so that Palmer’s name came first. The third team-up (“Autopsy and Eva”) was published in 1954. Palmer clearly contributed the lion’s share to these collaborations. At any rate, that’s what various commentators have speculated. But there was never any tangible evidence. Until now. Palmer wrote Dannay a letter dated May 10, 1953. Perhaps it accompanied the manuscript of “Autopsy and Eva.” Dannay—as was often his habit—scribbled some marginal notes on the letter. One note was a reminder to send payment of $400 to purchase a story (unspecified but obviously “Autopsy and Eva”), with $300 going to Palmer and $100 earmarked for Rice—so Palmer and Rice did not receive equal pay for this story. Conclusion? Theirs was not an equal partnership. This shows that Rice borrowed from Dannay (or, less likely scenario, from EQMM) and hadn’t made repayment. Craig is back in town with a new husband and a burning desire for a quick hundred, but since she’s never repaid anything I’ve lent her I did a quick brush off. She never gets a husband with a dime in his pocket. She says she has been writing, which I doubt and hope. The being “back in town” refers to Rice’s return to Southern California—where Palmer lived—after spending a little over a year in New York City. The requests for money become persistent enough that, according to a Palmer letter to Dannay dated June 26, 1953: “I have trained Winifred to say I am out of town whenever she [Rice] calls.” Winifred was Palmer’s wife from 1952 to 1963. Malone/Withers #4, “Rift in the Loot,” was published in the April 1955 EQMM. On the Palmer letter that presumably accompanied the manuscript and which discussed the story, Dannay penciled a note of “$400” to authorize payment and added to it “$300 – SP” and “$100 – CR.” This maintained the payment breakdown that was put in place for “Autopsy and Eva,” for which Rice had made little if any contribution. Probably the same holds true for “Rift in the Loot.” There was no notation this time to apply Rice’s payment toward debt. EQMM published the final two Withers/Malone tales in its February 1959 and November 1963 issues. Since Rice had died in 1957 (at age 49), experts have long assumed that Palmer wrote the final two tales all by himself. As often happens, the experts were wrong. At long last I am sending you “People vs. Malone and Withers” [which EQMM published as “Withers and Malone, Crime-Busters”], a screwball novelette which completes the Withers-Malone partnership. It will come to you through [literary agent Scott] Meredith, because he likes it that way. This is actually a story in which Craig did some work—she did two pages of the hospital sequence. So you can honestly say it’s a collaboration. Stuart Palmer Letters Copyright (c) 2017 by Jennifer Venola. 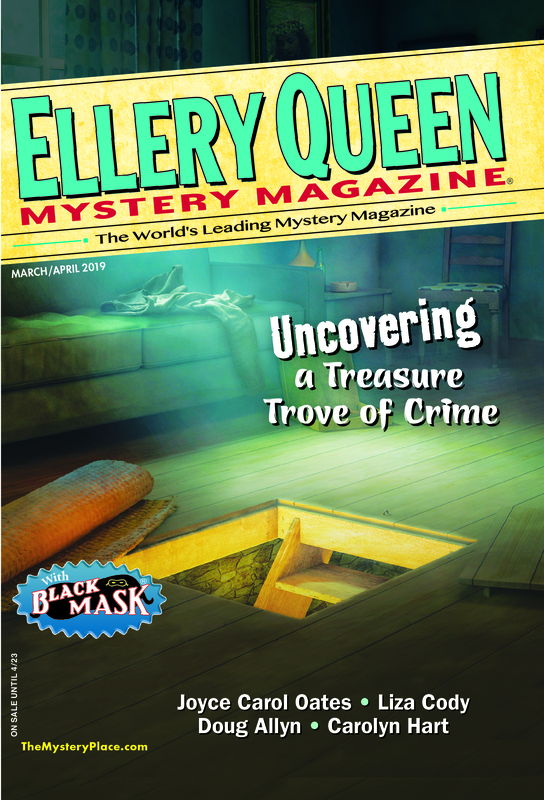 This entry was posted in Business, Characters, Editing, Ellery Queen, Guest, History, Magazine, Publishing, Writers, Writing and tagged crime, ellery queen, magazine, mystery, stuart palmer, suspense, writers, writing. Bookmark the permalink. A while back at Mystery*File, the subject of Mrs. O’Malley and Mr. Malone came up. I speculated at that time that it was MGM’s intention to do a series of second features with Marjorie Main and James Whitmore, but “circumstances” arose that prevented that from happening. May I take the Palmer letters quoted herein as sort-of confirmation of such circumstances? Mike … I’m afraid I don’t have a definitive answer to your question. MGM, as far as I know, merely wanted to purchase the rights to the published stories (or as you suggest, possibly to the characters themselves), to use or adapt however they saw fit, with their own screenwriters. I hesitate to conclude that any personal problems in the life of either of the short-story writers would influence MGM’s decision. But I can’t say for certain. Sounds like a question for a movie expert … which isn’t me.